See the advantage dealers across North America are talking about! What if you could access data that no one has before? Now you can. BookItOut aggregates transaction data directly from used car dealerships. We provide the actual purchase price, repair costs, sales price, gross profit and average days in inventory of a vehicle for a specific region, state, city and zip code. BookItOut's peer-to-peer data helps you buy the right car at the right price and appropriately price a used vehicle to maximize your profits. Traditional methods provide a price estimate for a broad geographic region based on auction data. BookItOut provides actual-cost transaction pricing by averaging accounting data acquired directly from dealers over the last twelve months. Our transaction-based used car values are specific to zip code and only available to subscribing members - we do not sell, license, or integrate our proprietary data to third parties under any circumstances. Whether you are selling cars, leasing cars, or insuring cars - use BookItOut's actual-cost vehicle values to properly value your collateral. Scan a VIN to get values on the go. Review Kelley Blue Book, Manheim Market Report, Black Book, and NADA used car values instantly, as well as AutoCheck, Carfax, and NMVTIS vehicle history reports. Track inventory across multiple locations and service departments - automatically updating your inventory or dealer management system. 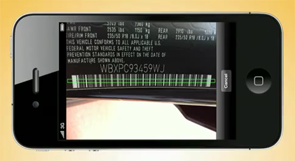 Reconcile inventory quickly, without pen and paper, using our VIN Scanner Plus mobile app and your smartphone’s camera. Automate the reconditioning process using BookItOut’s 75-point digital inspection report. Manage workflow, track progress, and save repair history. With queues and triggers, managers can easily pass work to service technicians before approving the vehicle for sale. Purchase vehicles using your smartphone - automatically updating your inventory and accounting (dealer management) system in real-time. We eliminate the hours of double-entry so you can focus on what you do best - marketing your newly acquired inventory as soon as possible. Marketing your new units is seamless and fast. With Inventory Syndication, take photos of inventory with your smartphone and update online listings instantly. VIN Decoding provides standard equipment and optional accessories for beautiful, fully customizable Window Sticker. Bilingual (English and Spanish) templates are easily customized, saved, and printed using your home office printer and plain paper. Window Stickers double as a quick way to reconcile inventory with the BookItOut Vin Scanner Plus mobile app. For dealerships interested in selling more cars, allow BookItOut to syndicate your inventory. BookItOut does not replace your website, rather it promotes your dealership, inventory and web presence. Eliminate duplication of effort to advertise online; manage your website and online listings in one place. Add inventory, take photos, and edit listings using either your smartphone, Dealer Management System, or BookItOut website. BookItOut functions as the hub for your online listings and inventory management: Ensure consistency and update in real-time. Boasting 99.9% uptime and unlimited bandwidth, trust BookItOut to host your media and reduce IT costs by automatically sending inventory information and photos to any source, such as your website provider or third-party classifieds including vast and oodle. cyclCRM is Customer Relationship Management simplified. Designed with cutting edge, web-based technology, cyclCRM makes no distinction between devices – full functionality exists on any Internet-capable device whether it is a mobile phone or desktop computer. cyclCRM is a stand-alone application that integrates seamlessly with your Dealer Management System. Both systems stay in sync as information is updated in either cyclCRM or your DMS. Managers can easily monitor leads within the sales pipeline and performance of sales personnel. cyclCRM provides a fully-customizable credit application that is hosted by BookItOut and quickly added to your website with a hyperlink. Leads, originating from the credit app, third-party websites, your DMS, or other source, are worked in an entirely automated and compliant manner. cyclCRM uses technology to verify information, such as the lead’s cell phone number and email, and attain approval for marketing communication. Salesmen can then communicate with the lead via telephone, email, and text message – all within cyclCRM, which stores and saves all correspondence for future reference. By integrating with BookItOut’s Digital Loan Jacket feature, images or documents, such as proof of income, are saved securely with an audit trail tracking when and who accessed the customer sensitive data. cyclCRM makes it easy to work hot prospects or to pass unqualified leads to upper management for review. cyclCRM is the first CRM of its kind, and a vital piece of the entire suite of products provided by BookItOut. Digital Loan Jacket revolutionizes electronic document execution and storage. Integrated with DocuSign, Digital Loan Jacket provides users the ability to electronically sign forms and store fully-executed documents safely and securely on the cloud for effective future recall. BookItOut facilitates real-time information flow by integrating directly with your dealer management system. View reports directly from your DMS on any Internet-capable device. Critical reports and financial statements are automatically archived, providing users a complimentary cloud-based backup. Reports are also optimized for mobile users, helping buyers in the lane know what is currently in stock and principals outside of the office monitor performance. After all, what gets measured gets improved. Stop guessing when it comes to stocking your used vehicle inventory. BookItOut tells you which vehicles to stock and where to find them. Our analytics calculate an ideal inventory mix specific to your sales history and local market conditions. We integrate with dealers and auctions to help you locate and stock the most profitable vehicles quickly and affordably. The BookItOut way to manage your inventory will soon become the industry's only way. Better data means better decisions. Dynamic visual charts and customizable dashboards redefine inventory and sales data. Flexible reporting, for a single rooftop or entire automotive group, drives performance by telling users information rather than them having to search for it. By integrating inventory management with market analytics, BookItOut dealers have the competitive advantage with intelligence never before offered. Review purchase recommendations based on sales history, market conditions, and trends. By leveraging state of the art technology with nearly thirty years of industry experience and relationships, BookItOut understands your needs and how to deliver results in a manner you can understand. On any Internet-capable device, you can monitor the activity on and off your lot as it’s happening and forecast what’s next.